Jubilee Springs is a company with a proud history. 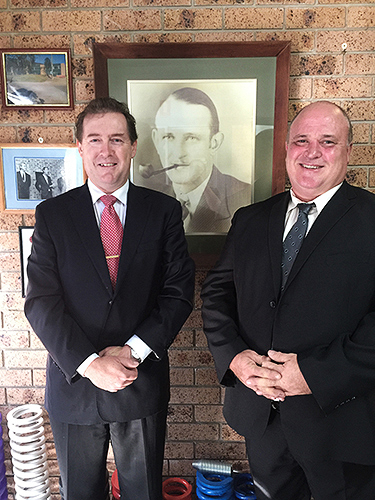 Pictured is co-founder the late John (Jack) Guest Snr, Mark Guest and Garry Burton. Mark Guest B.Ec (Syd) is now the Managing Director. Mark has been an Executive at Jubilee for well over a decade and he now oversees the efforts of the independent Management Team led by our CEO (Mr Burton). Also pictured to the left are former Managing directors John Guest Jnr and Stewart Guest. Stewart took over after John Snr’s retirement and John Jnr took over after Stewart’s retirement. Jubilee Springs have been spring manufacturers in Australia for 80 years, spending the first 50 years at Camperdown, serving the needs of the Sydney Metropolitan area. In 1989 we significantly expanded our operations and moved to Fountaindale on the Central Coast of NSW. Mark Guest & Garry Burton, pictured with our co-founder the late John Guest Snr. At Jubilee Springs we manufacture and supply many different types of springs and wire components and we have customers across Australia, as well as overseas. We are a 100% family owned Australian business and the Guest family have a proud history in the Spring industry starting with our company co-founder the late Mr. John Guest Senior. We design and manufacture custom made springs in Australia, as well as compression springs, torsion, tension, wire form springs and lots of other industrial springs. We are one of the leading wire spring suppliers in Australia and we can design and create any size or type of wire spring that you require. Each of these sections has a different function. For example, through the jobbing or Prototype and development section, we can meet the needs of our customers for small runs, samples, and spares for machinery breakdowns. Through our other sections, we can serve our customers needs for medium to large production runs. Our production capacity in wire products range from 0.25mm to 16mm wire diameter. We can also supply larger wire diameter products on request. Our production capacity in flat steel range from 0.15mm to 6mm thick and the types of materials include spring steel, stainless steel, phosphor bronze, brass, copper, aluminium and hi-tensile steels. Over the years we have maintained and improved our market share by producing a quality product, at competitive prices, supplied with our exceptional customer service. Our Quality Management System meets the requirements of ISO 9001 and it is being continually upgraded and maintained. This ensures that quality and safety are an integral part of all facets of our organisation. We look forward to the challenges of manufacturing in the 21st Century.